Looking for some cool Apple Watch mockups? You've found them with Placeit! We offer amazing digital mockups that are perfect for anyone to use. Try it out, just customize the settings to your liking. The best part of all, no additional software is necessary. Edit your Apple Watch mockup now. 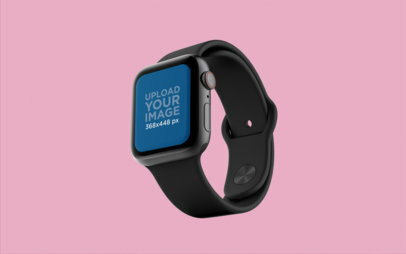 Promote your amazing Apple Watch designs on an actual Apple Watch! Placeit has a ton of cool mockups just for you. Just edit the settings to your liking, you can even make the background transparent! Try it out, it's easy to use and doesn't require any additional software. 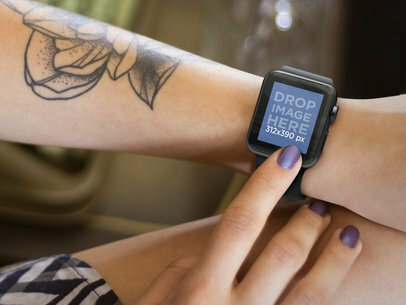 With modern visuals like this Apple Watch mockup, be sure your marketing campaigns will improve in no time! 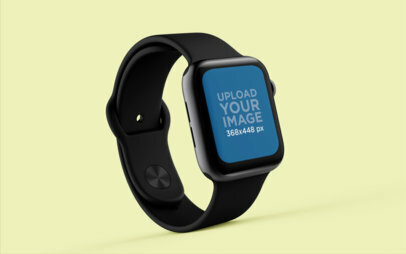 Show off all your awesome Apple Watch designs with Placeit's easy to use digital mockups. We create mockups that are trendy, fast, and functional. Customize the background to your liking, and you'll be ready to go in no time. 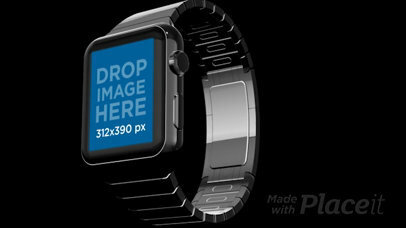 Edit your Apple Watch mockup now. Got some cool designs for an Apple Watch? Start showing them off with Placeit! We create easy to use and engaging visuals for your potential customers. 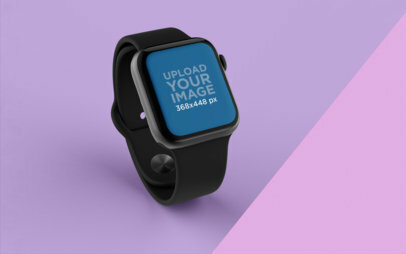 Improve your marketing strategy right away with an attractive Apple Watch mockup from Placeit now! Got some cool Smartwatch designs? Promote them with Placeit! Our mockups are super easy to use and don't require any additional software. You won't even need to hire a graphic designer, you can do it all on your own. 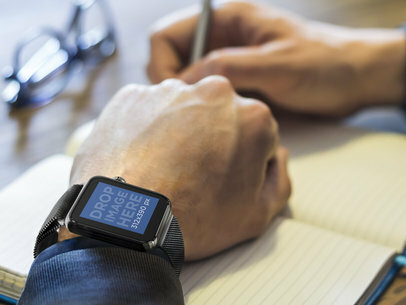 Get your Android Smartwatch designs out there now. 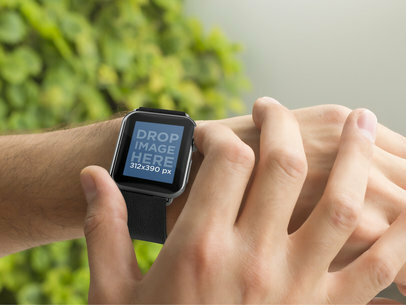 Looking for cool mockups for your Smartwatch designs? Try Placeit's digital mockups and start promoting your designs! 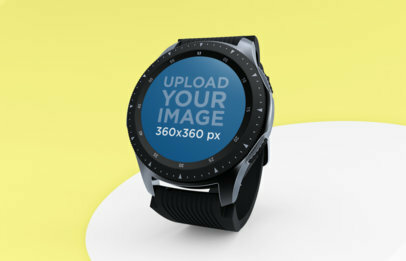 You can even change the Smartwatch background to promote your brand style. Cool, right? Try it out, it's super easy to use. 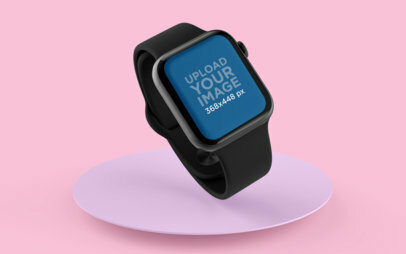 Promote your amazing Smartwatch designs with Placeit's digital mockups! Our mockups are super customizable, you can change the background and make the image your own. Try it out, it's amazingly fast. 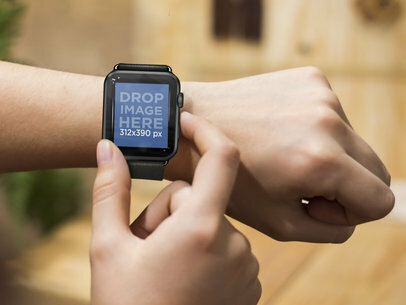 Edit your Smartwatch mockup now. Take a look at this smartwatch floating inside a black room, it's a gorgeous visual that you can use if you are looking to promote your latest app optimized for an apple watch! Start now, the only thing you have to do is drag-and-drop your jpeg or png image file over the interface. That's all! After a few seconds you'll see the processed image on your screen. Awesome, right? Try another Apple Watch Mockup! 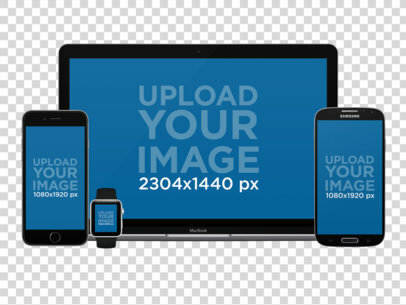 Imagine how great your new app will look on this multiple device mockup featuring a set of Apple and Android devices including a black Samsung Galaxy Phone, a Macbook Pro, Apple Watch and an iPhone in portrait front view over a transparent background, you can customize it by simply placing your content over the placeholders and our mockup generator will have your final asset ready in no time. This is a great responsive mockup to feature your new iOS app in! 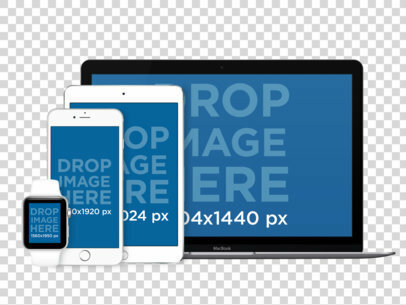 You can customize the iPad, iPhone, Apple Watch and MacBook Pro screens with your design by only dragging and dropping your images onto the placeholders and our mockup generator will have a download ready in no time. Create more digital mockups like this one by using our easy mockup tool and hundreds of mockup templates! If you’re looking for a hip, cool multi-device mockup template designed to showcase your new iOS app then do not miss out on this one. Simply featuring a bird’s eye view of a pair of male hands resting casually on a wooden table top, this Placeit template has it all. His right hand is holding a black iPhone 6 in portrait position and the left is wearing a black Apple Watch. A pair of black sunglass on the tabletop completes this attractive scene. All that’s missing here is your new iOS app or website. Trust Placeit marketing tools and connect to your potential customers with this eye-catching template. See it come to life when you make a custom mockup. Just drag and drop a screenshot of your app or website directly onto the screens in the template or you can click on the "Grab Screenshot From URL" button above the photo and type in the URL so Placeit can do it for you. Choose a scene your target market can relate to. Choose this Placeit Apple Watch and iPhone 6 marketing template today. Get your app on these devices in no time by simply dragging and dropping your image over the placeholders, our mockup generator will have your multi-stage mockup ready in just seconds. Promote your new app with multiple devices in less time and for less money, all you need is Placeit! Go ahead and start promoting your app with the best photo mockups! If you need a sleek and contemporary marketing tool to showcase your new iOS app then this Placeit Apple Watch and iPhone 6 iOS stock photo is the perfect choice. Here we have a young man wearing a black Apple Watch while holding a black iPhone 6 in an angled portrait position. A natural wood desk and a white computer keyboard are the only elements in the background to frame the close up look of your new iOS app placed right on the iPhone 6 and Apple Watch. Young multitasking millennials are a huge market and will instantly identify with this multi device scene. The only thing missing in this Placeit template is your app. Make a custom mockup now and bring this scene to life. Just drag and drop a screenshot of your app directly onto the screens or click on the "Grab Screenshot From URL" button above the photo and type in the URL as prompted so Placeit marketing experts can do it for you. Reaching your target market is only a Placeit mockup template away. This Apple Watch Mockup is just what you were looking for to display the new iOS app you designed for the amazing Apple Watch. This mockup presents the device in a beautiful manner that fully displays the screen in a portrait position and providing the perfect scenario to make your app stand out and shine under the spotlight. Take a good look at the device, isn't it cool? It has a black sport band that holds the silver aluminum case watch. This is one of those devices that will change the way we look at technology and the way we use it in a daily basis. You will want to be one of the first to use Apple Watch Mockups to display your iOS app, and you can do that by simply dragging a screenshot of your app straight into the Apple Watch, your end result will be an amazing image for you to share with potential users as a part of your app marketing campaign. Go ahead and try this Black Apple Watch Sport Mockup. This Gold Apple Watch stock photo template does a superb job of creating an eye-catching yet elegant backdrop so your consumer can focus in on your new iOS app. This scene has a beautiful color scheme, it is framed by an orange water glass on a white wooden tabletop, this mockup template features a close-up view of a young woman’s hands wearing a gold Apple Watch with a beige band, the screen of this Apple Watch is poised perfectly to showing off your new app. If you’re ready to take your marketing strategy to the next level then get a custom mockup to showcase your iOS app now; Placeit marketing tools are always designed to be polished, relevant and effective. Just drag and drop a screenshot of your app directly onto the screen in the template or you can click on the "Grab Screenshot From URL" button above the photo and type in the URL so Placeit can do it for you. You don’t want to miss out on this one. This stunning Placeit mockup template is a simple and effortless design that really showcases your new iOS app. Don’t be afraid to subscribe to today’s minimalist trend with this Apple Watch iOS app marketing template. Be bold and make a powerful statement with a black Apple Watch displayed vertically atop a stylish natural wood backdrop. The cool neutral colors really allow your app to shine and steal the spotlight! The only thing missing in this template is your new iOS app. See it come to life with a custom mockup today. All you have to do is drag and drop a screenshot of your app directly onto the Apple Watch screen or you can click on the ""Grab Screenshot From URL"" button above the photo and type in the URL so Placeit can adjust it for you. Placeit creates versatile marketing tools for every target market and this Apple Watch iOS app template has the unique ability to appeal to every consumer demographic in style. 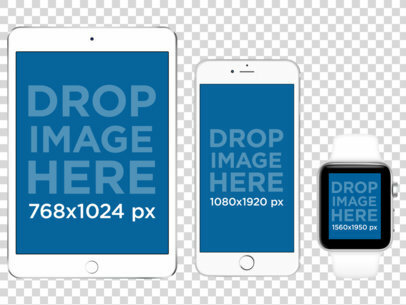 This Placeit Apple Watch stock photo template offers a truly compelling and realistic frame to show off your new iOS app. 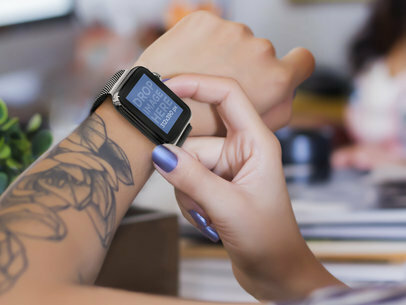 Take advantage of this high impact scene in which a young tattooed woman is using the pushbutton on her black Apple Watch to explore your new app during a busy day at work. This mockup template is so versatile; it’s perfect to showcase almost any kind of app and appeal to almost every target market. Whether she’s a tech-savvy art teacher or graphic designer, your app is a vital part of her busy day. See your app on this trendy template with an easy to create mockup. Just drag and drop a screenshot of your new iOS app directly onto the Apple Watch screen, or you can click on the "Grab Screenshot From URL" button above the photo and type in the URL so Placeit can do it for you. Trust Placeit marketing tools to leave a lasting impression on your potential customers with a simple glance at this Apple Watch iOS app mockup template. If you need a commanding marketing tool to showcase your new iOS app then this Placeit Apple Watch marketing template is simply perfect. This one features an ultra zoomed-in shot of your new iOS app on a black Apple Watch on a young woman’s wrist. This template is as polished as her freshly painted finger nail we see operating the pushbutton to check out your new app. It’s versatile, contemporary and the perfect frame to make your new iOS app looks its best. If you want to make a bold statement and leave a lasting impression on your consumers then this is the template for you. Get a look at your app on this template with a custom mockup. It’s fast and easy to do. Simply drag and drop a screenshot of your new iOS app directly onto the Apple Watch in the template, or you can click on the "Grab Screenshot From URL" button above the photo and type in the URL so Placeit can do it for you. It’s time to take your marketing strategy to the next level with elegantly designed Placeit marketing tools. This dynamic Placeit stock photo mockup really shows off your new iOS app. Check out this scene of a young man using his black apple watch to access your new iOS app while studying. A laptop and open book in the background complete the setup as you appeal to your target market with this true to life scenario. Today’s busy students know how to work smarter not harder as they have the most modern technology and newest apps in their arsenal. Connect to the constantly connected tech-savvy consumer group at a glance with Placeit marketing tools. 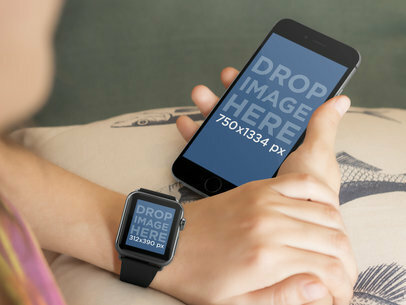 Place your app on his apple watch and see if this stock photo mockup could be perfect for you. It’s fast and easy to use Placeit app marketing software to create a custom mockup. Just upload your own screenshot of your website onto the Apple Watch or input the URL so Placeit can do it for you. A person uses a Samsung Galaxy Gear 2. This is a small, modern watch. The person is about to click a button on its side. 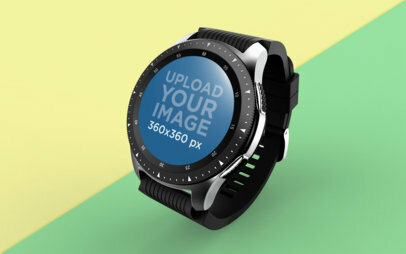 If you have a Samsung Galaxy Gear 2 app, you can use it on this mockup. Now this is what we call a compelling mockup! 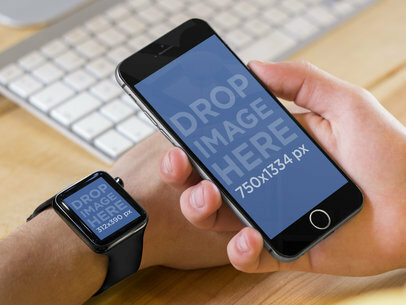 This stock photo template features a young woman who is using her black iPhone 6 in portrait position while checking her apple watch on the other hand, this is a great environment in which you will be able to display your new iOS app in two different screens! If you just developed a new iOS app for the Apple Watch, this is a great option that will display it in two different devices. 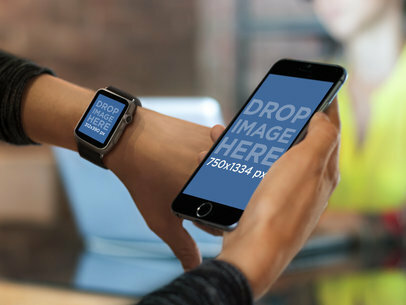 By using this mockup template you will enhance your app marketing campaign, all you need to do is drag and drop a screenshot of your app straight into the iPhone 6 and the Apple Watch to create an image that will showcase your iOS app or mobile responsive website's design and features while being used in a tech savvy context. More Mockup Templates here! See how your new iOS app comes to life with this smooth, practical Apple Watch mockup template by Placeit. The scene features a young man waiting at a café for his friends to arrive. In the meantime, he decides to check out your new iOS app on his brand new black Apple Watch and can't seem to take his eyes off it. The position of the man's arm and the blurry background make it easier for viewers to focus their attention on the Apple Watch's screen. The only thing missing here is a photo of your new iOS app! Don't miss out on a chance to showcase your app in a fresh, modern and realistic way. Try this template now by uploading or dragging a screenshot of your app directly onto the Apple Watch screen. You can also click on the "Grab Screenshot From URL" button above the photo and type in the URL so Placeit can do the work for you. Go ahead and try this black Apple Watch template. Creating photo mockups had never been this easy! This sleek stock photo png from Placeit has so much to offer. It features a young man working at his desk and includes both an Apple Watch on his left wrist while he explores your new iOS app on his black iPhone 6 smartphone held in portrait position. Frame your new iOS app in style with this attractive contemporary scene and appeal to your target market instantly. If you’re ready to take your marketing plan to a professional level then get a custom mockup of this stock photo png now. Placeit’s app marketing software is always easy and fast to use. 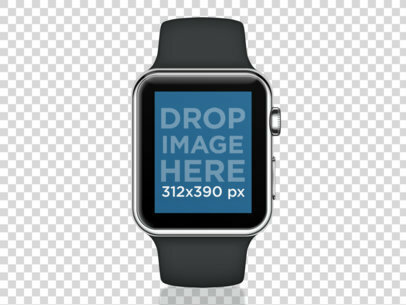 Just drag and drop your desired screenshot onto the Apple Watch screen and/or iPhone screen or upload a screenshot from a URL by clicking the ""Grab Screenshot From URL"" button above the template and typing in the URL when prompted. You’ll be on your way to making a powerful statement with this Placeit iOS app stock photo . 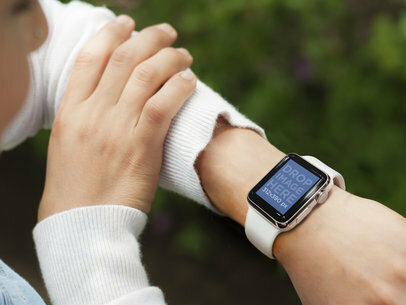 Get straight to the point with this apple watch stock photo of your new iOS app. Here we see a close-up shot of a young lady using the pushbuttons on her black Apple Watch to access your new iOS app at an outdoor ice-cream shop. It could be a new step tracker, calorie counter or coupon loader app she can’t wait to implement on her Smart Watch. Whatever it is your new iOS app has to offer, this scene brings it to life with a realistic scenario and polished design finishes that really make you look your best. Trust Placeit marketing tools to work hard for you when it’s time to introduce your new iOS app to the marketplace. Choose this bold, modern and no nonsense scene. Get a custom mockup now by simply uploading a screenshot of your new iOS app onto the template, or inputting the URL so Placeit can do it for you. Placeit knows you’ve worked hard to develop your new app or website and you’ve got a limited window of opportunity to make a lasting impression on your potential customers. You can always count on Placeit marketing tools to make your new app or website look bold, polished and current. This Apple Watch iOS app marketing template is the perfect way to appeal to the busy, tech-savvy target demographic. 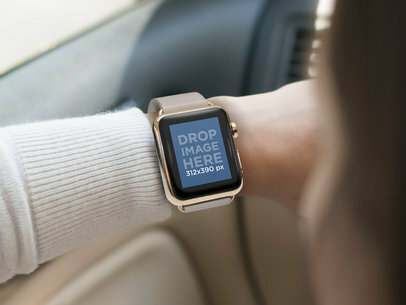 Here we see a close-up scene of a woman wearing a gold and beige Apple Watch while on the go as she steers her vehicle into another hectic day . Whatever she’s got on her agenda today, she clearly loves using your new iOS app to help her accomplish it. See a custom mockup of this template now. Just drag and drop a screenshot of your new iOS app directly onto the Apple Watch in the template, or you can click on the "Grab Screenshot From URL" button above the photo and type in the URL so Placeit can do it for you. There are so many ways to make this one your own and connect to your customers fast. If you need a tranquil stock photo template to show off your new iOS app then this Placeit marketing tool is the perfect one for you. Whether you’ve created a new sleep aid or gentle-wake alarm iOS app or anything in between, you need this soothing, relaxed scene to showcase it. 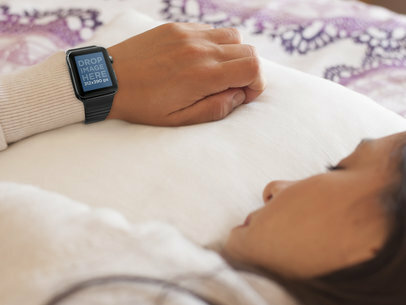 Featuring a young woman asleep while wearing a black Apple Watch on a white and lavender bedding backdrop, your new app is elegantly framed in sweet serenity. The only thing missing here is your new iOS app. If you’re ready to see this template at its best then Placeit app marketing software can help you create a custom mockup. Just drag and drop a screenshot of your new app directly onto the Apple Watch screen in the template, or you can click on the "Grab Screenshot From URL" button above the photo and type in the URL so Placeit can do it for you. It’s always fast and easy. Don’t miss out on this serene scene. Your new iOS app looks outstanding in this Apple Watch stock photo. This scene takes us up close and personal for an ultra zoomed-in look at your new iOS app on a black Apple Watch worn by a young man using the side pushbutton. Reading glasses and a handwritten notebook fade into the background as your iOS app demands all the focus. Appeal to the tech savvy, ever-connected, young professional with this cleverly designed Placeit template. The possibilities to connect with your potential consumers are limitless with this Apple Watch iOS app template. View your app on this template with a custom mockup today. Simply drag and drop a screenshot of your app directly onto the screen or click on the "Grab Screenshot From URL" button above the photo and type in the URL and Placeit will adjust the image for you. Your marketing strategy never looked so good with Placeit marketing tools. If you recently developed a cool new iOS app and need professional marketing tools to help you show it off, this Placeit Apple Watch iOS app marketing template is carefully designed to appeal to your busy, athletic consumer. Here we have a young woman wearing a gold Apple Watch with an orange band, she is holding a blue water bottle up for a drink during a workout. This modern woman has made your iOS app a part of her fitness routine and so can the rest of the huge health-conscious consumer demographic who enjoys incorporating modern technology into their wellness regimen. Connect with those potential customers today with this Placeit template. Creating a mockup is fast and easy. All you have to do is drag and drop a screenshot of your app directly onto the Apple Watch screen or you can click on the "Grab Screenshot From URL" button above the photo and type in the URL so Placeit can do it for you. 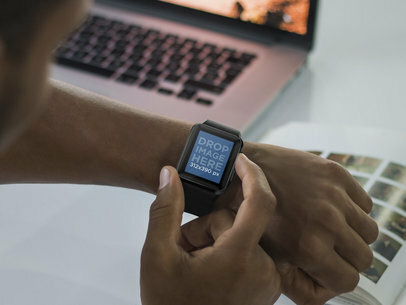 Choose Placeit marketing tools and take advantage of this winning apple watch stock photo right away! 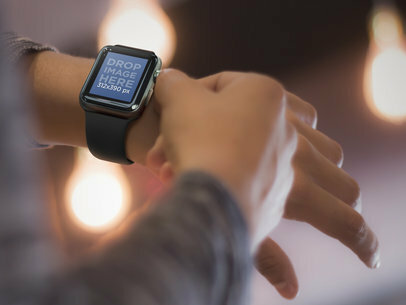 Take a look at this Black Apple Watch stock photo, it gets straight to the point as it features your new iOS app being used by a young man who is wearing the smartwatch on his left hand. A blurred newspaper is the simple backdrop of this sleek, zoomed-in shot of your new iOS app. The opportunities to reach your target market are endless with this versatile Apple Watch template. See this scene come to life with a custom mockup today. All you have to do is drag and drop a screenshot of your app directly onto the Apple Watch or click on the "Grab Screenshot From URL" button above the photo and type in the URL as prompted so Placeit will adjust it for you. You know a good opportunity when you see it, don’t miss out on this one and use this Apple Watch Mockup to display your new iOS app. This Apple Watch Mockup Generator is just what you were looking for to display the new iOS app you designed for the amazing Apple Watch. 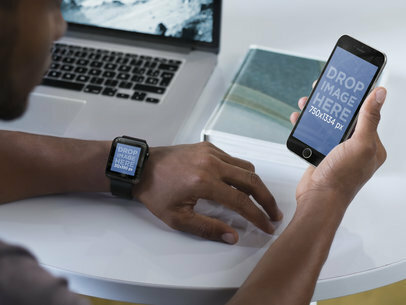 This amazing mockup template presents a young man who is wearing the device on his left wrist in a way that fully displays the Apple Watch screen in a portrait position, providing the perfect scenario to make your app stand out and shine under the spotlight. Take a good look at the device, isn't it cool? It has a space black stainless steel link bracelet that holds the silver aluminum case watch. This is one of those devices that will change the way we look at technology and the way we use it in a daily basis. You will want to be one of the first to use Apple Watch Mockup Templates to display your iOS app, and you can do that by simply dragging a screenshot of your app straight into the Apple Watch, your end result will be an amazing image for you to share with potential users as a part of your app marketing campaign. 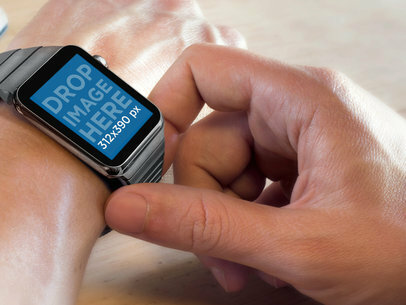 Go ahead and try this Black Apple Watch mockup template on a man's wrist! 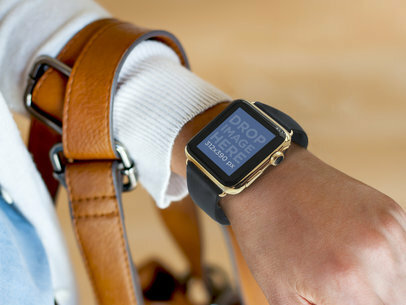 This Apple Watch Stock Photo is truly the perfect way to speak to your specific target market at a glance. Here we see a woman out and about and stopping to consult your new iOS app on her black Apple Watch she wears on her left wrist. A cleverly placed brown handbag also hangs from her arm to really illustrate how busy individuals on the go need and love your new app and can easily access it anytime, anyplace with today’s modern technology. Don’t miss out on this opportunity to showcase your new iOS app with polished, versatile and relatable Placeit marketing tools. Creating a mockup template is always fast and easy. Simply drag and drop a screenshot of your new iOS app directly onto the black and gold Apple Watch in the template, or you can click on the "Grab Screenshot From URL" button above the photo and type in the URL so Placeit can do it for you. There’s no better time to trust Placeit and take your marketing strategy to the next level. You won’t be sorry you chose this elegant and straight to the point iOS app stock photo template. It’s light, airy and artfully captures your potential customers’ attention fast while leaving a lasting impression. 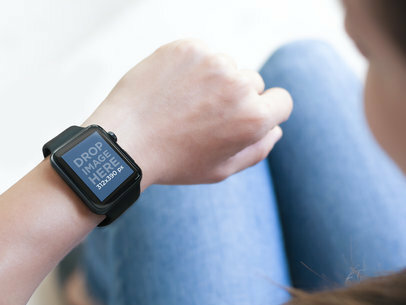 Select this close-up scene of a young lady wearing a black Apple Watch on her left wrist and enjoying your new iOS app while sitting on a grey couch by a bright window. See this mockup with your app on her Apple Watch now by creating a custom mockup. Simply drag and drop your desired screenshot onto the template or import a screenshot from a URL by clicking the "Grab Screenshot From URL" button and type in the URL so Placeit can do it for you. It’s always fast and easy to use Placeit’s app marketing software. Whatever it is your new iOS app has to offer, demand the attention you deserve and introduce it with professional and polished marketing tools from Placeit. 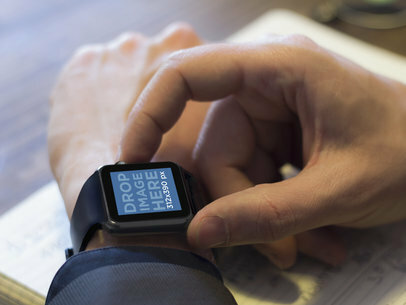 Close-up of a Young Man Using his Apple Watch Out at Night "
This close-up look of your new iOS app on this young man’s App Watch is the perfect scene for creating a stylish and sophisticated marketing tool. Your potential customers will see you at your best when you choose this dynamic Placeit iOS app marketing stock photo template. The backdrop is a dark night and blurred lights, which cleverly focuses all the attention onto the young man using the pushbutton on his Apple Watch to access your new app. Whether it’s a taxi locator, weather alert, or social calendar app you’ve created, this stock photo template can showcase all it has to offer the marketplace with polished and professional charm. Try out this stock photo template now with a custom mockup. Simply upload your own screenshot or input the URL so Placeit can do it for you and you’re quickly and easily on your way to stylish marketing tools for your new iOS app. 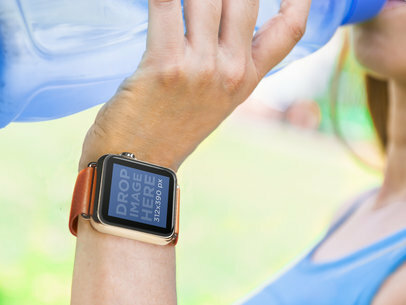 This colorful Apple Watch stock photo from Placeit marketing tools is the perfect frame to show off your new iOS app. Choose this stock photo template featuring a close-up scene of a young woman using the pushbutton on her black Apple Watch to access your cool new iOS app. It’s bright, versatile and has a really hip vibe that will appeal to the large young and tech-savvy consumer demographic. Use Placeit iOS app marketing software to create a mockup template today. It’s always fast and easy. All you have to do is drag and drop a screenshot of your new app directly onto the Apple Watch screen in the template, or you can click on the "Grab Screenshot From URL" button above the photo and type in the URL so Placeit can do it for you. Trust Placeit marketing tools to supply you with vibrant and expressive stock photos for all your new iOS and android apps. 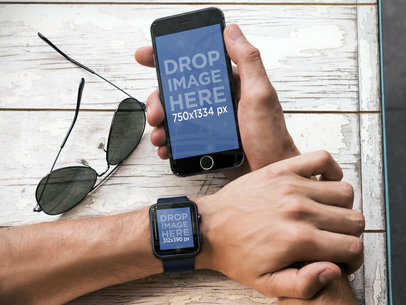 Choose this eye-catching Placeit Apple Watch stock photo template and you’ll be delighted at the attention it will generate for your new iOS app. This one is really adaptable, featuring a photorealistic, close-up scene of a young woman checking out your new iOS app on the black Apple Watch on her left wrist over a backdrop of her blue jeans. It is fresh and straight to the point: your new iOS app. Placeit marketing tools are always designed with your target market in mind. 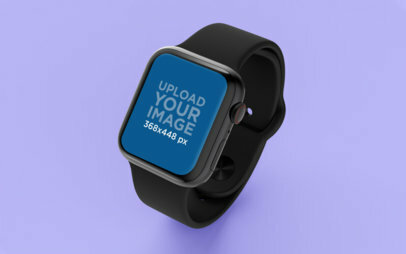 Behold the true impact this template can have on your potential customers by creating a custom Apple Watch mockup now. Simply drag and drop a screenshot of your new app directly onto the Apple Watch screen in the template, or you can click on the "Grab Screenshot From URL" button above the photo and type in the URL so Placeit can do it for you. It’s time to get your app the attention it deserves. 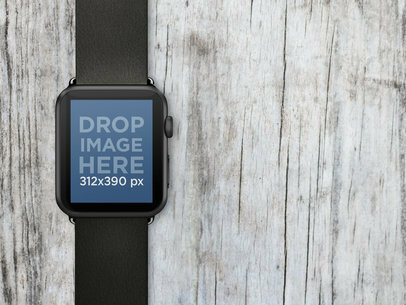 This impressive Apple Watch stock photo template from Placeit is the perfect frame for your new iOS app. It’s casual, attractive and persuasive. 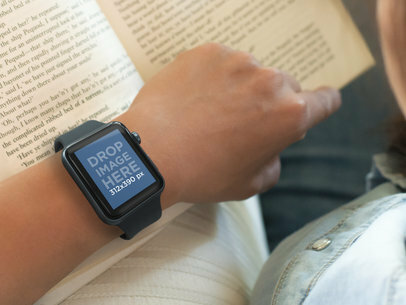 Featuring a young woman sitting down with a book in her lap and her arms crossed over her blue jeans, this orange Apple Watch on her wrist shows off your new app wonderfully. She may be at school or waiting for someone while using your app, since it is obviously a must have for passing the time. The possibilities are limitless here to fill in the rest of this story and relate to your target consumer. If you’re ready to see this template at its best, quickly make your own custom mockup. All you have to do is drag and drop a screenshot of your new iOS app directly onto the Apple Watch in the template, or you can click on the "Grab Screenshot From URL" button above the photo and type in the URL so Placeit can do it for you. Use Placeit mockup tools today to enhance your app marketing strategy. This rustic stock photo template from Placeit marketing tools features a close-up scene of a man wearing a black Apple Watch and outfitted with khakis and sunglasses while holding a colorful woven satchel over a backdrop of natural wood planks. Whether he’s a hiker, mountaineer or lumberjack, clearly this rugged outdoors man is clever enough to utilize your new iOS app on his next endeavor. Appeal to specific consumer groups with this commanding Placeit stock photo template and see it come alive when you use Placeit app marketing software to generate a mockup template. It’s always fast and easy to do. Simply drag and drop a screenshot of your new app directly onto the Apple Watch screen in the template, or you can click on the "Grab Screenshot From URL" button above the photo and type in the URL so Placeit can do it for you. Leave a lasting impression on your target market with polished and sophisticated Placeit marketing tools. If you need a simple, realistic and practical marketing template to compliment your no-nonsense marketing strategy then this is the one for you. Make a bold statement with Placeit marketing tools and this Apple Watch iOS app marketing template. This one features a close-up shot of a young man using the pushbutton on his black Apple Watch to show off your new iOS app on a neutral backdrop. There are so many ways to make this one your own and appeal to every consumer market. See a custom mockup of this template now. Just drag and drop a screenshot of your new iOS app directly onto the Apple Watch in the template, or you can click on the "Grab Screenshot From URL" button above the photo and type in the URL so Placeit can do it for you. Bring this expertly designed scene to life quickly and easily today. It’s time to give your new iOS app the marketing tools it deserves. This particular template offers an energetic scene your target consumer can identify with. A young lady checks out your new app on her black Apple Watch while waiting in a doctors’ office or during a work break. There are so many possibilities to make this template your own and connect to your target market. Wherever she may be, she is always connected and stoked to access your app. See this template with your app on the Apple Watch by making a custom mockup. It’s quick and easy to do. Just drag and drop a screenshot of your app directly onto the screen in the template, or you can click on the "Grab Screenshot From URL" button above the photo and type in the URL so Placeit can do it for you. Get started now, you won’t regret trusting Placeit marketing tools to make you look your best. Don’t be afraid to outshine your competition when you put Placeit marketing tools to work for you. Your new app always looks polished and sophisticated with Placeit marketing templates. Choose this unique Apple Watch iOS app template and appeal to a wide variety of consumer groups. Featuring a young tattooed woman using your new app on her black Apple Watch, a cool vintage typewriter and drinking glass jar in the background create a hip vibe that’s truly eye-catching. See this scene come to life by making a custom mockup. Simply drag and drop a screenshot of your app directly onto the Apple Watch in the template, or you can click on the "Grab Screenshot From URL" button above the photo and type in the URL and Placeit will do it for you. Choose Placeit dynamic and persuasive marketing temples and take your marketing strategy to the next level. This attractive and realistic Placeit marketing template features a young woman checking out your iOS app on the white Apple Watch on her left wrist over a simple backdrop of outdoor greenery. She’s a busy, tech-savvy woman on the go and your app is clearly a favorite companion for all she has to accomplish today. If you app saves her some precious time, money or simply brightens her day, this is the marketing tool to showcase all it has to offer your potential customers. 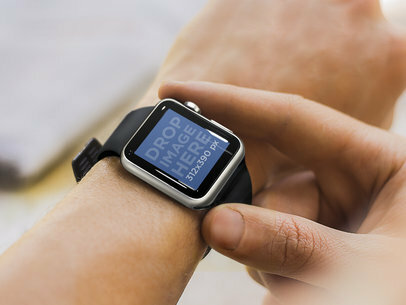 Connect to your target market at a glance and try this one on for size with a custom mockup featuring your app on the Apple Watch screen. Just drag and drop a screenshot of your app directly onto the screen in the template, or you can click on the "Grab Screenshot From URL" button above the photo and type in the URL so Placeit can do it for you. Don’t miss out on this opportunity to make a lasting impression with this polished Placeit Apple Watch marketing template. This man knows a good thing when he sees it and wants to show the world your awesome new iOS app. Choose this ultra zoomed-in scene of a tech-savvy man using his black Apple Watch, a simple green leafy background fades in the distance behind. This Placeit marketing template is all about your iOS app and there are no limitations with this one. Whatever your new iOS app has to offer, this template is perfect for appealing to every target market. The only thing missing here is your app. See it now with an easy to make mockup. Just drag and drop a screenshot of your app directly onto the screen in the template, or you can click on the "Grab Screenshot From URL" button above the photo and type in the URL so Placeit can do it for you. Do not miss out on this compelling Placeit marketing template. Trust Placeit marketing tools to showcase your app today. If you’ve created a new iOS app and need to appeal to the studious college student or book enthusiast then this Placeit template is the perfect way to showcase it. Check out this Apple Watch iOS app marketing template specially designed with your target market in mind. Here we have a young lady reading a book while wearing a navy blue Apple Watch on her left wrist. She could be at a library, school, on her daily commute or simply at home. Whether it’s a readers’ companion, book club, or homework helper app you’ve developed, this template speaks volumes to your target consumer. Create a custom mockup of this template quickly and easily to see it come to life. All you have to do is drag and drop a screenshot of your app directly onto the screen in the template, or you can click on the "Grab Screenshot From URL" button above the photo and type in the URL so Placeit can do it for you. Appeal to your specific consumers with effective and versatile marketing tools from Placeit. This Placeit multi-device stock photo template really wants to show off your new iOS app and/or website. Featuring both a black Apple Watch and a black iPhone, the possibilities to make a powerful statement is limitless with this template. Your potential consumers won’t be able to take their eyes off this gorgeous scene. Here we have a young lady wearing a black Apple Watch on her left wrist while holding a black iPhone in an angled portrait position in her right hand. The simple backdrop is a white and blue cushion beneath her hands. Don’t miss out on this unique chance to make double the impact. This versatile Placeit marketing template is as dynamic and energetic as your new iOS app. 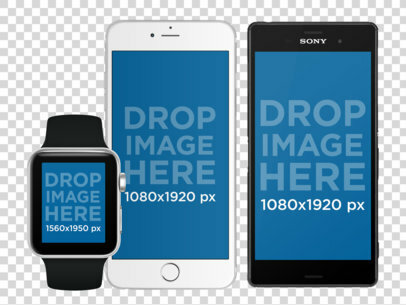 Try showcasing your new iOS app with this beautiful multistage stock photo template of an iPhone 6 and an Apple Watch right away as a part of your app marketing campaign. If you've created a new iOS app and you’re finally ready to connect with your potential customers quickly then it’s time to choose Placeit mockup templates. You'll always find polished and unique marketing templates when you trust Placeit. This one features a young woman lounging at home and checking out your new iOS app on her black Apple Watch. Here we cleverly get a look over her shoulder at what has captured her attention and made her happily decline social invitations for the night. Who wouldn’t want to spend a cozy, quiet night in with your new app? There are so many ways to make this versatile template your own. Try it on for size with a custom mockup. It’s fast and easy. Simply drag and drop a screenshot of your app directly onto the Apple Watch screen in the template or you can click on the "Grab Screenshot From URL" button above the photo and type in the URL so Placeit can do it for you. A relaxing night in never looked so good. If you’re looking to make a lasting and powerful statement when promoting your new iOS app, look no further than Placeit app marketing tools. This particularly sleek Apple Watch iOS app marketing template is perfectly designed to appeal to your on-the-go, tech-savvy consumer. 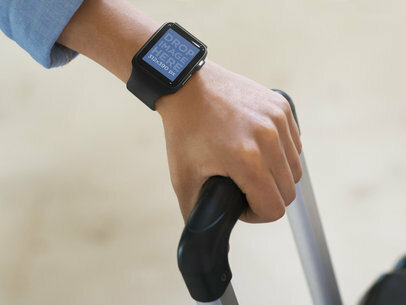 Here we have a close-up look at your new iOS app on a black Apple Watch worn on a young lady’s wrist as she totes her rolling luggage bag. There are so many possibilities to make this one your own. Whether it’s a step tracker, flight alert, hotel reviews or traffic alert app you’ve created, this Placeit marketing template is the perfect avenue to showcase all it has to offer the young, connected traveler. Get a custom mockup of this template fast. Just drag and drop a screenshot of your app directly onto the screen in the template or you can click on the "Grab Screenshot From URL" button above the photo and type in the URL so Placeit can do it for you. Don’t let your new app get left behind, use Placeit stock photos today.